Merely checking to see how this picasa->lighbox plugin works, this Flickr embed….BTW, this photo was taken very early one morning back in 2005 in the neighborhood of Once. For some reason, perhaps because I so clearly remember this early morning walk, this remains one of my favorite photos. Long-time readers of this blog know that our Buenos Aires home was on the border of San Telmo and Barracas. But since last November we’ve been staying at a place in Recoleta. A short-term housesitting gig turned into a longer opportunity. 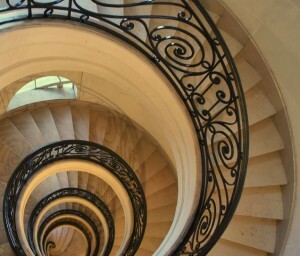 It’s one of those beautiful Recoleta apartments…an absolutely astonishing staircase. Good to experience what it’s like to live in a different part of the city, but I have missed the edge of San Telmo and Barracas, particularly Bar Britanico and Hipopótamo. Around Recoleta I just can’t find any good cafes with that type of character. All the places around Recoleta are too posh & modern for my tastes (and maybe that’s just reflective of the neighborhood). Any recommendations? Our house in Mar del Sur is under renovation. We plan to move to the coast in December, right in time for the Argentine summer…yeah! That means I only have a few more months to enjoy the city of Buenos Aires. Oh, I’ll be back for visits…just six hours away by bus… but it may be a long time before I live here again. There’s so much of Buenos Aires that I’ve still not seen…so many streets I want to re-visit…so much more to blog about. I’ll try to do more blogging in these upcoming four months.